This Babe has been bogged down with work the past few days, hence no time to update this blog. I guess updates will also be sporadic for next week since I'll be off the whole week in conjunction with the Deepavali and Hari Raya Aidil Fitri holidays. In view of that, I'll just show some pictures on what's happening around in Masjid India area which uniquely have a bazaar with the combination of both Indians of the Hindu faith and Malays of the Muslim fare. The moment I stepped down from the bridge over Klang River at the LRT station, there were stalls lining up the road side. Many of them selling clothes, belts, wallets and etc predominantly displaying goods to usher in Hari Raya Puasa. More of them in front of Wisma Yakin and Masjid India. I was enjoying the occassional blast of Hari Raya songs but as I walk along, the scenery kinda changed. Towards the part of Wisma Hanifa and Semua House, the stalls were displaying Indians wares and I have to endure the loud Bollywood songs from nearby music shop. Heh, the best of both world? At the backlane of Globe Silk Store (is it Jalan Bonus??) more stalls lined up both sides. Since it was hours before buka puasa (breaking fast), many stalls were preparing and cooking food. So I would not have much photos on buka puasa fare. I guess those you can visit Masak-masak to feast your eyes on all the local goodies found in the various Ramadhan bazaar that boo_licious visited. Okie, less talk... feast your eyes! Click to view a larger picture. Prayer beads and lots of other miscellaneous items. 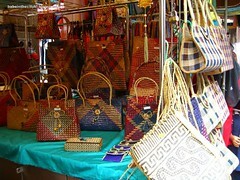 Woven mengkuang bags. So many shapes and colours, take your pick. Selendang (shawls) in myriad of colours. Sarong batik which I think came from Indonesia. A lady checking out the baju kebaya and baju kurung (traditional Malay woman dresses). These baju are made from batik prints cloth made popular by our late First Lady. Baju kurung for little girls. Oh they're so pretty! Got sequins some more... darn wished I have a girl. Silky batik cloths waiting to be tailored into beautiful baju kebaya or baju kurung. Baju Melayu (traditional Malay men's clothes that is usually worn with samping as seen in the left picture. There are many types of samping and ways of wearing them). Songkok (traditional Malay men's headgear). They are usually made of velvet. Capal (traditional Malay men's leather footwear that goes with their baju Melayu). Since I'm a mommy, I tend to be fascinated with the kids version. Yes, these are child sized Capal. So cute. Muslim lights oil lamp around the house compound. I kinda forgot for how many days and for how long. Sorry, no time to research with my Muslim friends now. Tonnes of cookies and bags of murukus and chips. Indian sweetmeats. I tried some and they're lovely. Bought some from the guy in stripes. He saw me taking photos and asked whether I'm from the media kakakaka... Then the guy in white was playing with the little girl asking her to smile at the camera. So I offered to take a photo of them smiling from ear-to-ear. Deck your home with some Deepavali decors. I loved the way the shops displaying their saris. Kinda like a fan and they're so beautiful shimmering under the light. Children kurta (a type of traditional Indian men's clothings). Fancy decorating your tables with some table runners and table cloth? Rolls of plastic table cloth waiting to be cut to size. Nothing beats flowers for festivities be it real or fake. Beaded screens... ohhhh soooo RETRO! to all my Muslim friends Selamat Hari Raya. Maaf Zahir Batin. I gaped when I first saw the announcement on Kitchen Chick. The theme for this round of Is My Blog Burning is soufflés!!! Arrrghhhhhhh what am I gonna do? It's such a challenging theme after hearing so much about disastrous results that I have never bothered to make any attempt in making soufflés. I surfed around, did some research and hey presto... there were so many sites that encourages virgin soufflés baker to attempt in making one. Well, I did and I'm not looking back. Thanks to Kitchen Chick, I can now proudly proclaimed that I've successfully made soufflé! A Lemon and Orange Soufflé that is. Thank goodness I've made this before my boiboi fell sick last week, otherwise I would not have any submission for IMBB#20. I got the recipe from BBC Food and this recipe is by Paul Rankin from Ready Steady Cook. Since there is no BBC channel in Malaysia and I've never set foot in UK, I really have no idea who is he. I picked this recipe after combing through some since I have those ingredients on hand. It seems really easy peasy. Errr YES, it is indeed very easy, I can vouch for it now. 2. Bring the milk, vanilla essence, honey, citrus zests and half the sugar to a simmer in a pan. Remove from the heat. 3. Whisk the egg yolks and butter in a bowl until pale and fluffy. Whisk the mixture into the milk until combined. and glossy. 5. Fold into the original mixture until combined. 6. Grease two ramekins with butter and dust with sugar. Spoon the soufflé mixture into the ramekins and then bake in the oven for 8-10 minutes, or until well risen and golden. 7. Remove from the oven and serve at once. This was how the soufflés looked like after popping into the oven. I was waiting patiently by the oven to check if they rises or not. Yikes started to deflate the moment they were outta the oven. Took a quick snap and faster spoon some into my mouth right at the kitchen counter. *OUCH* I burnt my tongue hehehehe greedy me! It was yummilicious. The orange and lemon zests did wonder in making this a slight tangy, not too heavy dessert. Lovely! I will make more next time using the same recipe but I need to cut down on the sugar cos I find it a tad too sweet. I also need to use larger ramekins as the recipe yielded 2 ramekins (I'm not sure what's the size) and another larger soufflé kinda dish. I ate most of them and I was certainly on a very sugar high evening that day! Thank you Kitchen Chick for hosting and thinking of such a challenging theme. This month's Sugar High Friday is the 13th installment which is hosted by Kelli of LOVESCOOL. Since this is the first anniversary edition, Kelli had picked dark chocolate as the theme in contrast with the first edition where white chocolate was the theme. SHF has gone a long way since Jennifer of The Domestic Goddess started it. Check out what cooked up the past one year here. Actually I was like hesitating in participating cos I've hardly have any time to cook up anything these days. What more when my boiboi was sick the whole of last week. So that explained why there are more outside food review recently hehehe... Anyway, I found a simple (yeah "simple" is my middle name kekeke and "easy peasy" is my other nickname) recipe in about.com where I can cheat my way out. I've made Pain au Chocolat, apparently a French bakery favourite. It's merely chocolate wrapped in puff pastry. Got the recipe here by Debra F.Weber but I did it according to my way. Of course I've used frozen puff pastry, otherwise there won't be any entry by me. Substituted the chocolates with dark ones. Cut up dark chocolates into pieces and rolled out pastry. Cut the pastry where the height was enough to cover the chocolate pieces. 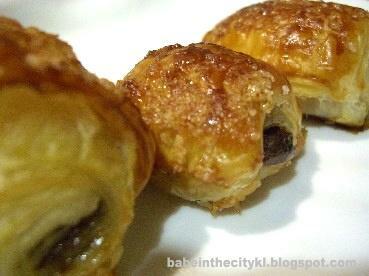 Placed one piece of chocolate on the edge of pastry and rolled up tightly, completely enclosing the chocolate piece. Placed the rolls on a baking sheet, seam side down. This is very important cos I didn't really heed this and some of the pastry puffed up on the side. Not a very pleasant sight okay but still tasted the same plus guinea pig didn't complain. Brushed with egg wash and sprinkle with some sugar. Baked in pre-heated oven until golden brown. Yeah it was that easy. Thanks Kelli for hosting. Our First Lady, Datin Paduka Seri Endon Mahmood passed away at 7:55am at Sri Perdana, the Prime Minister's official residence in Putrajaya, following a lengthy battle with breast cancer. My deepest sympathy to Datuk Sri Abdullah Badawi and family. It's going to be hard on him since they are both such a loving couple whom never shy to display their love in the public. As a mark of respect, a moment (24 hours to be exact) of silence will be observed here in my blog. Public can pay last respect beginning 11:00hr at Sri Perdana, Putrajaya. Funeral will be after Zohor, about 16:00hr, and the remains will be taken to Putrajaya mosque for prayers. Burial will be at Precinct 20, Putrajaya. UPDATED 21 Oct 2005: It's sooo sad watching the news last night. Tears flowed freely this morning when I read the newspapers that I had to stop myself from reading. Otherwise I would ended up having Ruddolf's nose. May Allahyarhamah Datin Seri Endon rest in peace. This is a no brainer thing to make. Just followed the instructions on the konnyaku jelly packet. Dropped in some nata de coco and canned mixed fruits into the molds. This time I've steeped an Earl Grey teabag instead of replacing the liquid with fruit juice. Removed the bag and using low heat, stirred in the jelly and sugar mixture spoon by spoon. Kept stirring slowly till all mixture were blended. Spoon into molds and let cool before placing them in the fridge. Easy peasy. The photos looked like crap but trust me they looked better in real. This is a very very lame post actually but anyway... I was bored after hubby left for TT (a term coined for gathering at Mamak stalls selling famous teh tarik or pulled tea) with his friends. I have some bananas on hand and I decided to experiment a bit. I dumped in a couple of banana with the skin on into my toaster oven. Baked them for about 5 minutes. Took them out and peel the blackened skin off. Be careful ya, it's super hot. I drizzled in some chocolate sauce and a generous dose of Kahlua. Super yummy I would say. There are many other variations, so use your imagination and try them all. Awwww this morning whilst coming to work, Angus' forehead got grazed by an unknown object. Could be stone or could be whatever. Poor Angus now has got a large 20 sen bruise on the forehead and a tiny fleck of bruise that he had gotten sometime back. Have to send Angus to the hospital soon and poor poor daddy's pocket gonna have a large hole! Sighhh hopefully the insurance might be able to cover the hospitalisation fees.